Habits wether they are good or bad, are formed through repetition. Habits mainly consist of knowledge, skill, and desire. Habits are the foundation of training. It takes 21 days to instill a habit and 3 days to break one. All habits, even deeply rooted habits, can be changed with proper preparation, planning and execution of the new plan. Habits are simply routines of behavior that are repeated on a regular basis and in time tend to occur subconsciously. Most importantly they are occurring without directly thinking consciously about them. Technically, any regular routine is a habit, since after awhile, every routine by it’s very nature become habitual. Of course, the best way to stop any “bad habit” is to never let them start in the first place. You see, habits form familiar neural pathways in the brain which makes it more difficult to break a pattern of behavior. When ever an action is repeated, a neural path is fired inside your brain, making it easier the next time the action is repeated. Thus the cycle becomes easier and easier, because the neural pathways tend to like to travel the easiest path. The longer a “habit” is there, the harder it is to break. If a habit is left uncorrected for years it just gets harder and harder to break as it becomes more and more ingrained into the personality of the dog. If you have ever tried to break a bad habit, you know first hand how hard it can be. Bad habits are easier to abandon today than tomorrow. So the first step is to identify the “bad habit” or inappropriate behavior. Try to understand why this behavior is rewarding. All behaviors are driven by two motivators. Receiving a reward or avoiding discomfort. So what is the motivation for the bad habit? Or what is driving the behavior? Also you would want to know what leads up to the behavior. Behaviors are sets of cascading events and they tend to follow the same of similar events over and over. This is the definition of a habit, repeating the same behavior automatically. So identifying the earliest trigger of what leads to the “bad behavior” can help us interrupt it before it follows through. Next, try to define what behavior you would like to see instead of the “bad behavior”. This will become your goal. This goal must be in line with the motive or drive of the “bad behavior”. In other words if the “bad behavior” is chewing the couch, you would want to replace that behavior with chewing on their toy. But what happens right before the dog goes to the couch? And what happens right before that? You see we need to intercept the trigger signal so we can start a new cascade of behaviors. This is the starting point for changing the habit. Interrupt the trigger and redirect it to the new behavior. So you see why it is important to define what you want the dog to do instead of the “bad behavior”, because until we know what we leave the door open for the “bad behavior” to occur again. So the first part of our new chain of events is to go get the toy. Make it a command, make it fun, make it a game. Going to get the toy might seem like a simple skill, but to your dog it may be more complicated especially if the couch tastes so much better. Is this better than the couch? Next we must create a reason to continue chewing on the toy. This can be as easy as filling the toy with treats. Like a kong filled with treats is a great way to encourage chewing on it. 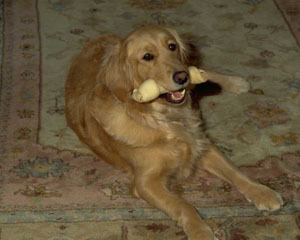 Also raw hide chews can keep the dog occupied for a while as well. Once we have these two skills in place we are ready to introduce them in context of the “bad habit”. For this to happen we must perform a stake out and set the dog up. Hide in a way that you can see your dog and the couch and trigger the couch chewing signal. The moment your dog begins to smell the couch, interrupt them and tell them to get their toy, reward them for doing this. Timing is essential to the training process. Repeat again at a later time. Remember until the new habits are stable, allow no exceptions to occur. “Just this once” is your enemy to the formation of good habits. Every exception is a chance to regress back to bad habits. All distractions are invitations for exceptions. Distractions test your dogs impulses. Behavioral training is a few simple steps. Define your goal. Refine your habits. Resist invitations for distractions. Behavior training is simple, it’s just not easy. Previous post: What’s The Most Important Skill In Dog Training? Next post: Discover The Reasons For Proper Motivation In Dog Training.